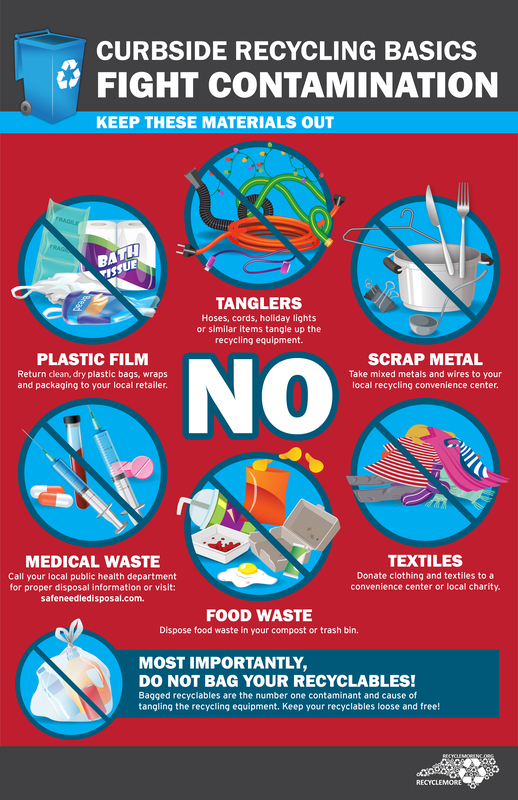 In 2017 and 2018, China implemented a series of waste import restrictions limiting or banning a variety of recyclable materials, including multiple types of plastics and mixed fiber. As the largest consumer of the world’s scrap material, China’s policies have caused global impacts to recycling markets. Communities and businesses in the U.S. are seeking new markets for materials previously exported to China. They also are experiencing depressed market values due to the abundant supply. While the southeastern U.S. is faring better than other parts of the country, local impacts in North Carolina are still being felt. Each year, the Recycling Business Assistance Center (RBAC) – a team within RMMS – offers grants of up to $40,000 to an individual business to pursue projects to expand processing and/or manufacturing capacity for recycled materials in North Carolina. The RBAC business development grants create new jobs and encourage private investment within the state. In anticipation of China’s change in recycling import policies, the RBAC targeted the 2018 grant cycle to prioritize projects that addressed materials affected by China’s import ban (mixed paper, #3-7 plastics, bulky rigid plastics and agricultural plastics). As a result, 11 of the 21 awarded grants will expand domestic markets in North Carolina for these specific materials. Similarly, the 2018 grant cycle prioritized expansions or improvements to material recovery facilities that have been hit hard by depressed market pricing and high contamination rates. An additional three grants will support material recovery facility upgrades to improve efficiency and produce cleaner, higher quality end materials. The RBAC is also leveraging grant funding in 2019 to prioritize investments that build and support recycling markets for the materials impacted by China’s policies. The RMMS produced a free anti-contamination toolkit for communities, haulers and material recovery facilities to use to help educate customers about what does and does not go into the recycling cart. 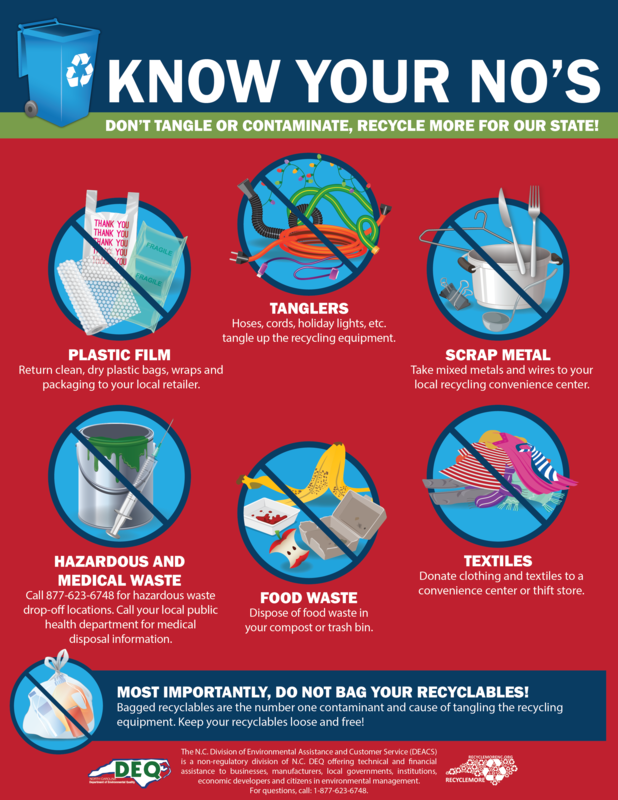 All outreach materials are free and can be found at: https://deq.nc.gov/conservation/recycling/general-recycling-information/outreach-materials. These anti-contamination graphics and education materials can also be tailored to individual community needs – free-of-charge. Contact Mel Gilles, recycling outreach specialist, at (919) 707-8127 for assistance with customizing outreach materials. The RMMS staff have been working one-on-one with communities and businesses to find solutions to changing market conditions. Staff are available to provide individualized technical assistance upon request. Contact Matt James at (919) 707-8133 for assistance. Partnered with regional communities, material recovery facilities, private recycling haulers and other industry leaders to host a Coastal Regional Recycling Messaging Roundtable. Participants discussed market conditions, contamination issues and ways to partner on regional recycling messaging to improve and strengthen recycling infrastructure and recovery in the region. Presented at numerous recycling conferences and workshops about market conditions, strategies to improve recycling programs and messaging, and market development efforts. The RMMS staff is planning for continued outreach and engagement with partner organizations including the Carolina Recycling Association, National Recycling Coalition, NC SWANA, APWA-NC Chapter, Southeast Recycling Development Council, Carolinas Plastic Recycling Council, Appalachian Energy Summit, Centralina Council of Governments, and Triangle J Council of Governments. Appeared as a guest on public radio WFAE’s Charlotte Talks: Everything You Always Wanted to Know About Recycling and contributed to other local news outlets covering stories about current recycling conditions (including WUNC's When In Doubt, Throw It Out). Will host a series of anti-contamination workshops this winter in collaboration with the Carolina Recycling Association and The Recycling Partnership to assist local governments with educational messaging and resources to reduce recycling contamination. Supported three local governments with 2018 Community Waste Reduction and Recycling Grant funding to reduce contamination in their local recycling programs. Created and distributed messaging for state employees about the importance of reducing contamination in recycling stream at work. Share news and resources with North Carolina communities and recycling businesses in regular email distributions. Local government update emails are sent approximately once per month, while the online newsletter publication for recycling businesses, Recycling Works, is published quarterly. Track market pricing on a quarterly basis from three recycling processors in North Carolina’s eastern, central and western regions and publish data on the Recycling Market Pricing Trends website.